The Army Security Agency is Born! The U.S. Army has supported its fighting forces with signals intelligence since World War I. The first permanent organization to do this was established in 1930 as the Signal Intelligence Service. During World War II, the SIS (renamed the Signal Security Service in 1943 and later the Signal Security Agency - SSA) exploited the communications of both Germany and Japan, shortening the war and saving many thousands of American lives. The SSA was reorganized as the Army Security Agency (ASA) at Arlington Hall Station, Virginia, on 15 September 1945. Operating under the command of the Director of Military Intelligence, the new agency had a sweeping charter. It exercised control functions through a vertical command structure. ASA established a worldwide chain of fixed sites - "field stations" - while maintaining large theater headquarters in the Far East and in Europe. In 1949, all three military cryptologic services were centralized under the new Armed Forces Security Agency (AFSA), the precursor of today's National Security Agency. ASA transferred most members of its large civilian headquarters staff to AFSA in this process. However, because of the need once again to support troops in actual combat in the Korean War, ASA again expanded, deploying tactical units on a large scale to support the Army in combat. For the first time, ASA grew to include groups and battalions in its force structure. In 1955, ASA took over electronic intelligence (ELINT) and electronic warfare functions previously carried out by the Signal Corps. Since its mission was no longer exclusively identified with intelligence and security, ASA was withdrawn from G-2 control and resubordinated to the Army Chief of Staff as a field operating agency. In the 1960s, ASA was again called upon to assist U.S. forces in the field. On 13 May 1961, the first contingent of Army Security Agency personnel arrived in South Vietnam (setting up an organization at Tan Son Nhut Air Base) to provide support to the U.S. Military Assistance Advisory Group and help train the South Vietnamese Army. During the early years of conflict, ASA troops in Vietnam were assigned to the 3rd Radio Research Unit. Their primary mission was to locate Viet Cong transmitters operating in the south. This mission was in its early stages when one of their direction finding (DF) operators, SP4 James T. Davis, was killed in a Viet Cong ambush on a road outside Saigon. The date of the ambush, 22 December 1961, made Davis the first American soldier to lose his life during the Vietnam War. The death of Davis brought home to ASA the dangers to proceeding into the jungle with short-range DF equipment to locate VC transmitters that might be only a few miles away. Since radio wave propagation in Southeast Asia required that DF equipment be very close to the transmitter, the obvious answer was to go airborne. ASA engineers began working on the problem, and by March 1962 they had their first airborne DF platform, a single-engine aircraft that flew low, slow, and had room for only a few people. In the fall of 1962, one veteran arrived in Vietnam assigned to the 3rd Radio Research Unit. He recalls that after Davis was killed operating a jeep-based PRC-10 direction finding unit, someone decided that this function could be better handled from the air. Within days, soldiers in the unit were calling it TWA (Teeny Weeny Airlines). With the introduction of large U.S. ground combat elements into South Vietnam in 1965, the ASA organization in-country expanded. The 3rd RRU was replaced by the 509th Radio Research Group, which commanded three battalions and company-size direct support units assigned to all Army divisions. One of the 509th's subordinate battalions was the 224th Aviation Battalion (Radio Research), which pioneered in the introduction of Special Electronic Mission Aircraft (SEMA) to the battlefield. At the height of the war, the 509th radio Research Group commanded some 6,000 ASA personnel in-country. Meanwhile, the agency itself had greatly expanded, reaching a strength of 30,000 and attaining the status of a major Army field command in 1964. However, the massive drawdown of the Army after the Vietnam War led to pressures to achieve economies by the consolidation of intelligence functions. 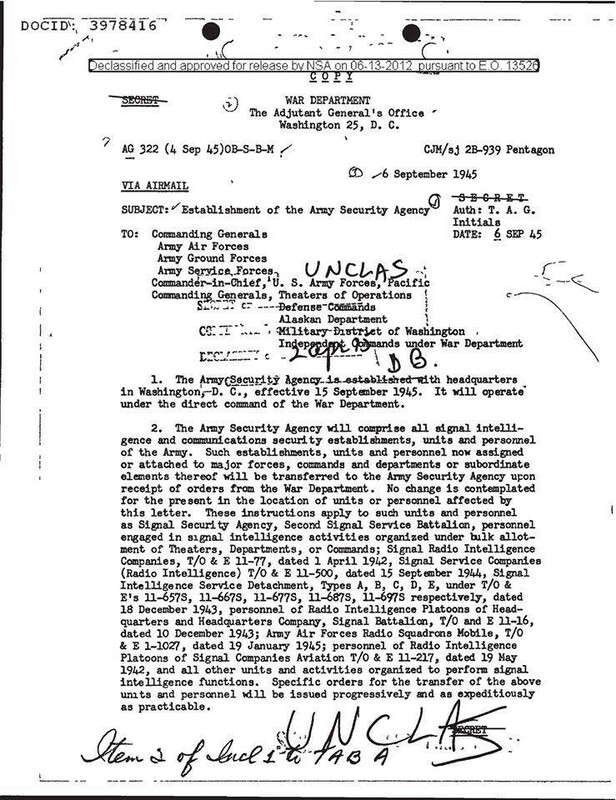 In 1975, the Army Chief of Staff accepted the recommendations of the Intelligence Organization and Stationing Study and agreed to a wholesale reorganization of Army Intelligence. The decision was made to create multidisciplinary military intelligence organizations within the Army at both the tactical and departmental levels. As a result, ASA was effectively dismembered. ASA's tactical units were resubordinated to the local commander, its functional responsibilities for training and research and development spun off to other major army commands (MACOMs), and its headquarters and fixed sites used as the nucleus of a new intelligence and security MACOM. On 1 January 1977, Headquarters, U.S. Army Security agency, was redesignated as Headquarters, U.S. Army Intelligence and Security Command. Following World War II, little was done in the Army's airborne signal intelligence arena. Through the 1950s, ASA operators flew electronic reconnaissance missions in Navy EA-3B Sky Warriors. In the early 1960s, ASA crews again flew on board the EA-3Bs within a project called FARM TEAM. It was at this point that the Army had made a decision to invest both manpower and funds in order to have its own ability to expand its intelligence coverage of enemy forces within a theater of operations which appeared to be increasing in both size and complexity. The early days of Vietnam truly marked the beginnings of Army airborne signals intelligence. The Army's U-6 Beaver was one of the first platforms converted from a utility mission to take on intelligence collection efforts from the air. As a result, it was officially redesignated as the RU-6. This, in effect, initiated the process wherein most of the remaining Army aircraft which eventually became incorporated within this emerging fleet of signals intelligence platforms, were also redesignated with a reconnaissance or "R" prefix designator. The RU-6A aircraft was a relatively simple and basis platform equipped with on-board mission receiver equipment for homing in on signals emitted by enemy forces. The data returned were only as accurate as the pilots' navigational skills. With no doppler/inertial navigation system (INS) or global positioning system, the pilots relied on landmarks and dead reckoning to determine their known location from which to calculate the intercepts. One veteran recalls his early days in Vietnam flying in a Caribou with an experimental system. The operators hung a long wire out the back of the aircraft for a crude direction finding antenna. Crews flew in hot, humid conditions in very loud aircraft. Missions were often four hours long, but could be longer depending on the operational tempo of the forces in contact. It has been said that air missions produced as much as one third of the intelligence known to ground forces. The single-engine companion Army platform, the RU-1 Otter, was similarly configured with personnel and equipment, but it was an expanded platform. But it wasn't until the introduction of the Army's RU-8D Seminole that a significant advance was made in the SEMA fleet and in the contribution these intelligence platforms were providing the theater tactical commanders. In addition to having on-board mission equipment similar to that found initially on both the RU-6A and the RU-1A, the RU-8D aircraft were equipped with the Marconi doppler navigation system. This required the copilot to manually plot the ARDF fixes (locations) to large pads of graph paper on his lap. (Masking tape was applied to the aircraft doors to prevent the plotting sheets from being sucked out of the aircraft.) Also, the RU-8Ds were equipped with blade antennas in the wings, which gave them the capability to home in on a transmitter and fly a standard flight pattern to achieve the geometry necessary to obtain several lines of bearing (LOB). Although overflight of the actual target sometimes occurred, the procedure for flying the pattern for triangulating the target tried to prevent overflight whenever possible. Additionally, some of the aircraft were configured with radio fingerprinting to further enhance signal identification. The mission gear on board these RU-8D aircraft were known by the nicknames WINEBOTTLE, CEFISH PERSON, and CHECKMATE. These aircraft, with the on-board systems and crews, truly became the new workhorse of the Army's SEMA fleet primarily due to a combination of the improved mission gear and a newly introduced multi-engine capability, each contributing to expanding and improving the unit's mission coverage in several dimensions. In 1968, a project known as LAFFIN EAGLE entered service with the Army and within Vietnam. It used the Army RU-21 aircraft with additionally improved mission gear to include an automated direction finding capability as a result of the use of an on-board inertial navigation system. With the follow-on introduction of three JU-21 LEFT JAB into Vietnam, the Army now had the first airborne collection system to give 360-degree direction finding coverage. It was also the first system to use a digital computer to store calibration tables for the DF system and to calculate emitter locations from the LOBs generated by the "Spaced Loop" DF antenna and aircraft position data furnished by the on-board INS. In essence, what the RU-6A, the RU-1A, and, most importantly, the RU-8D had provided and accomplished as the Army's initial trio of signals intelligence platforms was now resident in the proliferating fleet of RU-21s in both Vietnam and CONUS. Finally, a truly special unit was formed and deployed to Vietnam using Army pilots, Army ASA mission operators on board a Navy P-2V Neptune four-engine aircraft. This Army project was a significant leap in both mission coverage and overall mission capability. As with most of the other platforms, these aircraft were redesignated specifically as RP-2E aircraft with an associated mission project name of CEFLIEN LION or CRAZY CAT. The remaining platforms which also contributed to the Army's airborne signal intelligence capability were six specially configured UH-1 helicopters. These aircraft were redesignated as EH-1 LEFT BANK aircraft and were assigned directly to the tactical war-fighting divisions in Vietnam. These LEFT BANK assets were manned and maintained by ASA operators, also found with the same divisions. Their flight profiles included both high- and extremely low-altitude operating envelopes necessary to locate and target tactically oriented enemy threats of immediate and times-sensitive value. Often, the ultimate customers for the information did not understand the capabilities of the systems. They expected to be able to go to a given location and find the enemy at that location speaking on the radio. There were some constraints with the systems, in that the location of the target could be depicted as an elliptical core - not a pinpoint target. Therefore, the emitter was not always exactly where the report indicated. Radio Research Units (RRU) operated in Vietnam under the direction of the U.S. Army Security Agency (ASA) Group. During this time, these operations were classified and operated under the auspices of the 3rd RRU, activated on 23 May 1961. Its ASA nomenclature was the 400th USASA Operations Unit (provisional) until 23 September 1961 when it was redesignated the 82nd USASA Special Operations unit. The 3rd RRU assets included detachments specifically incorporating the RU-6A, RU-1A, and the RU-8D platforms, mission gear, and crews. On 1 November 1964, the unit was redesignated as the 53rd USASA Special Operations Command and on 1 June 1966 was again redesignated as the 509th USASA Group and as the 509th Radio Research Group (RRG). On 3 July 1967, the 1st Radio Research Company (Aviation) was assigned to the 224th Aviation Battalion (RR) to provide direct support to U.S. Military Assistance Command, Vietnam (MACV), flying six RP-2E aircraft from Cam Ranh Air Base, Vietnam, on 13-hour missions. By June 1969, the 224th Aviation Battalion (RR) with its headquarters company and five operational aviation companies had over 1,100 personnel and eighty aircraft. The battalion and the LEFT BANK elements within the two radio research companies supporting the 1st Cavalry Division and 4th Infantry Division comprised the initial fleet of the Army airborne signals capability in Vietnam. The U-I Seminole was first introduced into the Army's inventory during the Korean War. The twin-engine aircraft was used for transportation of commanders and staff officers. ASA first used the plane as an airborne direction finding platform in Vietnam. The system became operational in January 1963. The RU-8 offered advantages over the RU-6 Beaver. For the first time, the 3rd Radio Research Unit had an all-weather capability. With its ability to carry three crew members (pilot, copilot, and intercept operator), the plane had enough room for navigational equipment. Unlike the RU-6, a crew would no longer be dependent upon visual landmarks to conduct operations. By 1971, unit drawdowns were beginning. On 30 September 1971 the 144th Aviation Company at Nha Trang was deactivated. More followed with the relocation of the 156th Aviation company from Can Tho to Fort Bliss, Texas. By 1 May 1974, this left the 224th Aviation Battalion with two companies, the 135th and 146th. When word was received from the Commander USMACV in June 1972 that support to Allied forces was still needed, the 224th was in the process of turning in its remaining RU-8s. For the next several weeks the emphasis was upon retrieving plans from turn-in and cannibalizing others for spare parts. But within ten days the first U-8 was back in the air, and within three weeks the level of missions had returned to normal. The RU-8s continued operating until the 28 January 1973 cease-fire and were among the last platforms to leave Vietnam. Following Vietnam, the RU-8s would remain as part of the 138th ASA Company (Avn) (USAR) stationed in Orlando, Florida. Three Army crews made the ultimate sacrifice while flying signals intelligence aerial reconnaissance missions under enemy fire. All of these were lost in the war in Southeast Asia and were the only ASA crews killed by hostile fire during the Cold War. Thirteen U.S. Army personnel were lost to hostile fire while performing the sensitive airborne intelligence collection missions. Of the thirteen, seven were U.S. Army Security Agency intercept operators and six were flight crew personnel. Six of these thirteen are still listed as Killed in Action/Body Not Recovered. One is listed as Died While Missing/Body Recovered. The others are listed as Killed in Action. These mission crews on board the two LEFT BANK aircraft were assigned to the 371st Radio Research Company. Originally designated as the 371st ASA Company, it was formed by the United States Army Security Agency in 1962 and was attached to the 1st Cavalry Division. It was with this division that the company saw wartime service in the Republic of Vietnam from 1966 to 1971. The mission of the 371st was to provide combat information to the division commander in pursuit of his tactical war-fighting mission. The company served well and faithfully, earning two Presidential Unit Citations, four Meritorious Unit Commendations, and one Valorous Unit Award. It was redeployed to Fort Hood wit the division in 1971 where it served with pride until deactivation in 1981. Its lineage and colors are now perpetuated by Company A, 312th MI Battalion, Fort Hood, Texas. The last ASA aircraft lost to hostile fire was a U.S. Army JU-21A LEFT JAB assigned to the 138th Radio Research Company based at Phu Bai, near the DMZ. On 4 March 1971 it took off on an intelligence-gathering mission. The aircraft headed northwest towards the DMZ between North and South Vietnam. Reportedly, the aircraft's mission was to collect intelligence regarding surface-to-air missile sites, either in the DMZ or just north of it. Shortly after departure, the JU-21A, tail #67-18062, was shot down. Retired CW2 Joseph Hayes recalls that day: "I was scheduled to fly on that aircraft. I had previous morse and DF experience. That morning, I was just climbing in, when someone came running up to the plane and told me that I had been bumped. SP6 John T. Strawn jumped on in my place. My duty assignment as briefing team chief just took priority over this mission. The CG ASA Pacific, General Wolf, was coming in and a briefing was required. I was put on the next C-130 out of Phu Bai for Tan Son Nhut. SP6 Strawn and the rest of the crew took off shortly thereafter and they never landed." National Vigilance Park stands to honor those "silent warriors" who risked their lives performing airborne signals intelligence mission during the Cold War. The RU-8D addition to Vigilance Park, dedicated on 12 May 1998, represents Army soldiers who were lost while performing aerial reconnaissance. The RU-8D mission equipment is removed from the aircraft and is on permanent display inside the National Cryptologic Museum. Both of these exhibits are a fitting tribute to our vigilant servicemen and women who were lost and to those who continue to serve in this vital mission for our country. Special thanks to Dennis Buley and Mark Scott of the ASA Veterans Association, James L. Gilbert, INSCOM historian, for input to and review of this brochure, and to COL(ret.) Carlos Collat and COL(ret.) Richard Mitchell. Oct 1946, encompassing both officer and enlisted training. Force Base in San Angelo, Texas and Corry Station, in Pensacola, Florida.